Find #1: These guys snuck aboard some abandoned naval vessels out SF. And here I thought I was badass sneaking into Greystone. My only complaint is: you sneak aboard an abandoned Destroyer and you only post a dozen pictures? Find #2: An abandoned military base (Vozdvizhenka Air Base apparently). I can’t be sure because the LjJ page is written in Cyrillic which I don’t speak or read. If anyone can tell me what it says I’d be appreciative. East Hanover Airport is located in Hanover NJ close to Route 280. It is located in what was the Glacial Lake Passaic. This was an area that was carved out by the last glaciers of the ice age that ended roughly 15,000 years ago. The area of Lincoln Park, Hanover, Chatham and the surrounding area floods frequently because of the low lying swamp land and the convergance of the Passaic and Pompton Rivers. The areas flooded badly several weeks and ago and 3 times in the last 4 years. the airport operated here from the mid 40’s until August 1985. The airport had been losing 10-15K a year and when a proposed office park fell thru, the airport closed for good. Thruout the 2000’s there were discussions of selling the 53 acres of land to the town or county and turning it into a park of some sort, perhaps funded thru the Green Acres fund. I came across a newspaper article in 2005 stating that this was the plan, but on a recent visit in 2011 it was clear that nothing has happened to date. The airport originally had a 2,000 foot unpaved runway which eventually became a gravel runway and later a paved runway that ran northeast/southwest. At the southeast corner (where the nearby road bends sharply now) sat a hangar and some other office buildings. Despite the short runway, DC-3’s made an occasional landing there. The airport’s FAA license was not renewed in 1984 which sealed the fate of the little airport. 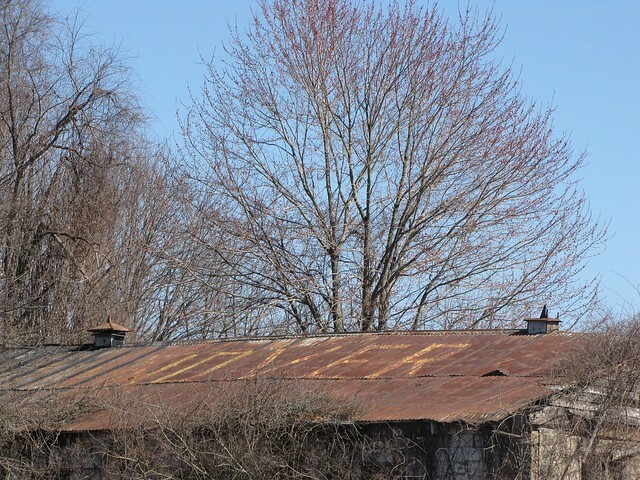 The land is apparently still owned by the owner from 25 years ago, but there is no evidence that the property will be converted to a parkland any time soon. there is, in fact, evidence that there is some sort of contamination at the site. I don’t know anything more then what this sign says, so if anyone has a clue, please let me know. All my flickr pictures can be found here. 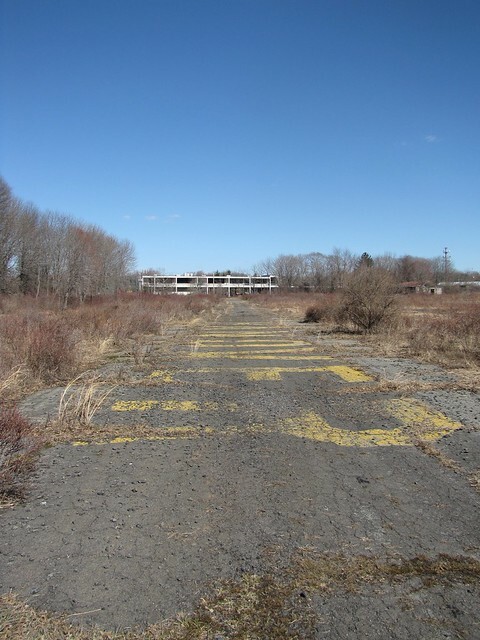 Most of the information about the history of the hanover airport was found here a website which focuses on abandoned airports nationwide. I have known about this place forever and had visited here in 2005. Not much has changed since then. Here is a picture of the office building from when the airport ewas open. Note the name of thew airport on the roof. Today it looks a lot worse for wear. When I was inside the building snooping around the tin metal sheets of the roof were shaking and flapping, making for am very unnerving experience. When iI emerged I realized why it sounded so loud. A turkey vulture had been perched on the roof and flew off before I could take a picture. 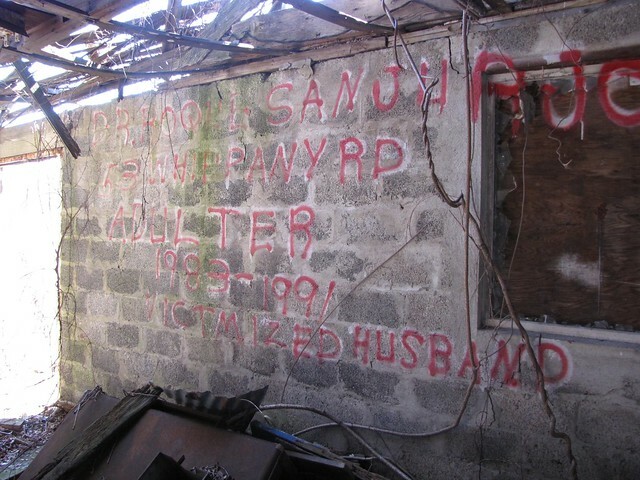 Inside the building I found the weirest grafitti, apparently outing a local resident who had been cheating his his spouse. Odd. This compass was painted on the ground so it was visible from the air. This would help pilots orient themselves. In the second picture you can see the compass from the air. The name of the airport was also painted in giant letters on the runway and are still legible after 3 decades. The facilities of the Aeromarine Plane & Motor Company were constructed in 1917 on the east side of Keyport, and an unpaved runway ran in between the factory buildings & the water. The airport closed around 1937, and the buildings were converted into warehouses and other related types of businesses came in. The field was described as having a single 1,000′ northeast/ southwest runway. The 1934 Department of Commerce Airport Directory (according to Chris Kennedy) described Aeromarine Field as having two sod runways oriented in an “L” shape, with the longest being an 1,800′ northeast/southwest strip. New York businessman Inglis Uppercu founded the Aeromarine Plane & Motor Company in New Jersey in 1914. Initially the Boland Aeroplane Company, Uppercu renamed the firm Aeromarine when Boland died in a crash & his widow sold Uppercu control. Focusing on mail delivery, these aviation innovators successfully delivered mail to a ship at sea in 1919. Aeromarine manufactured landplanes, flying boats, engines, and propellers. Aeromarine employed 900 employees at peak of the First World War. They produced 200 39-A/39-B aircraft for the USN beginning in 1917, converted Curtiss /Navy F-5lL & HS-2L flying boats into airliners,built 25 Martin MB-2’s as NBS-1’s in 1921-22, designed & built a number of other landplane & flying boats models in small quantities, and in 1923 built the first all-metal flying boat in the US. Aeromarine’s Inglis Uppercu was also credited with invention of the inertial starter. Aeromarine Airways Inc, began operations in 1919 between NYC & Atlantic City. They also operated between Key West & Cuba, NYC & Havana, and Cleveland & Detroit, all in Curtiss Flying boats. Aeromarine Airways ceased operations in 1923. The Aeromarine-Klemm Corporation operated from 1928-32, license building the German Klemm. The Upper-Burnelli Aircraft Corporation operated from 1929-34. Uppercu was Vincent Burnelli’s backer in his development of lifting body aircraft, that culminated in the Burnelli CBY-3 Loadmaster built in Canada. 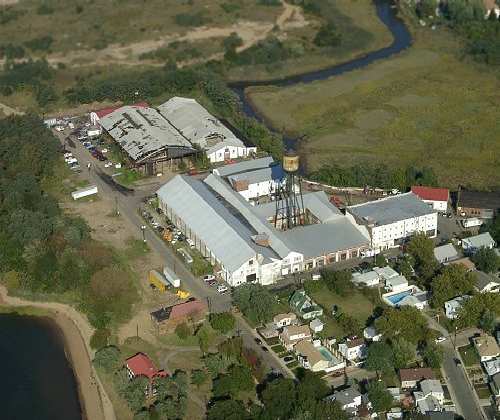 The Keyport Yacht Club had plans in 1997 for a modest portion of one building to be dedicated as a museum to the Aeromarine Plane & Motor Company, but summer 2005 will see the complete demolition of all buildings to make way for luxury townhouses. This goes against the wishes of local residents, judging by signs of protests on local lawns. All that remains is the hangar, which is clearly in very bad shape. An undated view of F-5L converted by Aeromarine (courtesy of Tom Beamer). 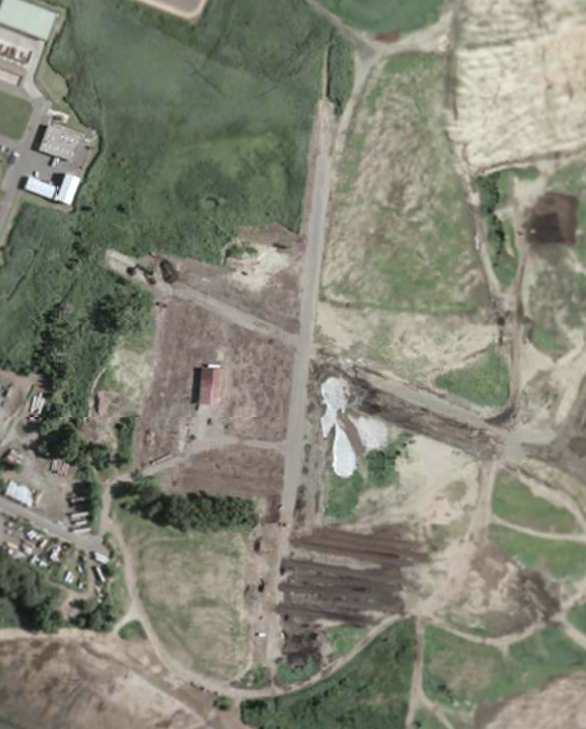 As seen in the circa 2000 aerial photo, the former Aeromarine factory buildings are still standing. 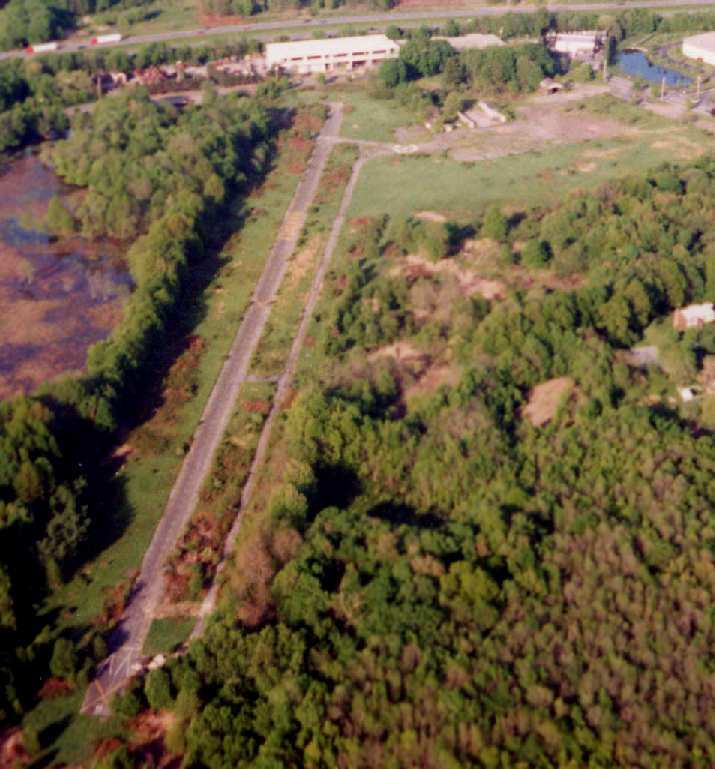 A 2003 aerial view by Rich Galiano, looking northeast at the former Aeromarine factory buildings. This abandoned airfield previously belonged to the J. Howard Smith Fish Factory in Port Monmouth across the Belford Creek. They had a plant there for processing Menhaden, and they used aircraft to spot schools of fish for the boats. It us unknown when it opened, but the The airfield closed sometime in the 1970’s. 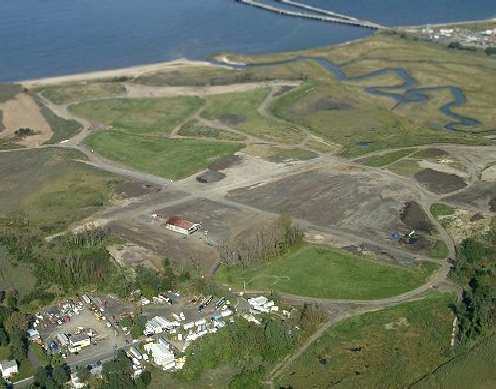 Belford Airfield is owned by Monmouth County and leased to the Middletown Department of Public Works for $1/year (or some such minimal figure). Officials were gracious enough to allow me to visit the site and document the operations. Part of the property is a landfill (now closed). The metal hangar remains but looks like hell. I spoke with one employee who showed me the interior and pointed out pipes that led to bathroom facilities for a small apartment for pilots. I commented the holes in the walls looked like bullet holes, to which he responded ‘There certainly are bullet holes! I know because I put them there as a kid!’ Apparently many of the pilots & their families were hunters. 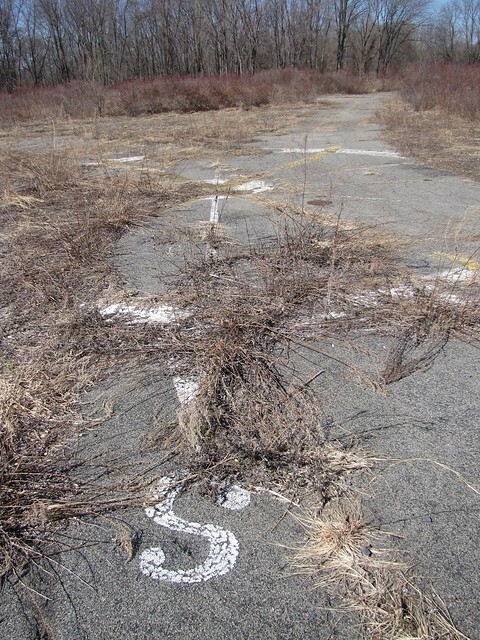 No airfield at this site could be located in either the 1962 or 1982 AOPA Airport Directories. The airfield wasn’t depicted at all on Sectional Charts from 1945, 1958, 1965, or 1975, the 1979 NY TCA chart (courtesy of Bill Suffa), or the 1969 USGS topo map. 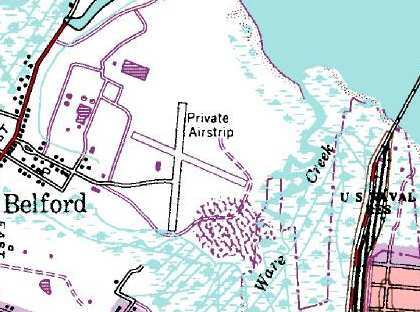 The airfield was depicted on the 1981 USGS topo map (labeled “Private Airstrip”) and the 1986 USGS topo map. As depicted on the 1981 USGS topo map, the airfield consisted of two 1,700′ runways, one oriented north/south, the other northwest/southeast. A circa 2001 aerial photo showed that the remains of both paved runways still existed, along with a single hangar, southwest of the runway intersection. 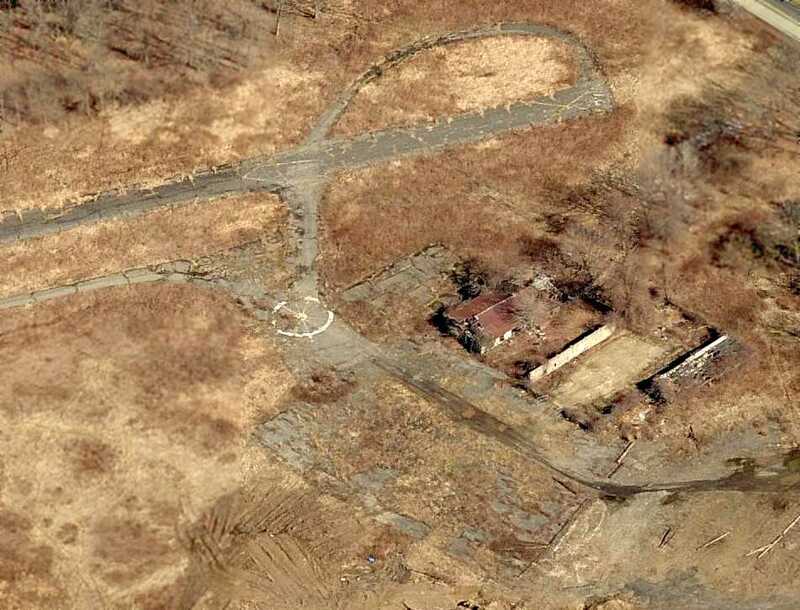 A 2003 aerial view by Rich Galiano, looking northeast at the Belford Airport.